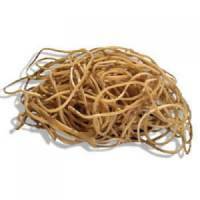 Initiative Rubber Band Assorted 454gm Pack of 1 454g resealable bags. 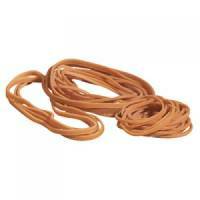 Initiative Rubber Band No 38 454gm Pack of 1 454g bags. 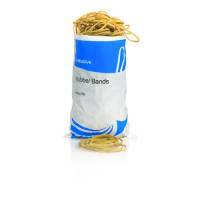 Initiative Rubber Bands No 36 (3 x 127mm) 454g Bags Pack of 1 454g bags. 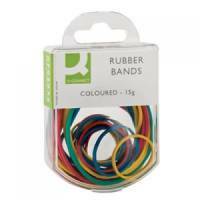 Q-Connect Rubber Bands Assorted Sizes Coloured 15g (Pack of 10) KF02032Q Pack of 10 Q-Connect Multi-Coloured Rubber Bands. High quality bands with a high latex content ensuring use time and time again. Supplied in handy 15g packs. Q-Connect Rubber Bands No.10 31.75 x 1.6mm 500g KF10520 Pack of 1 Q-Connect Rubber Bands. High quality bands with a high latex content ensuring use time and time again. Extra value 500g box. No.10 - 31.75 x 1.6mm (1 1/4inch x 1/16inch). Q-Connect Rubber Bands No.12 38.1 x 1.6mm 500g KF10522 Pack of 1 Q-Connect Rubber Bands. High quality bands with a high latex content ensuring use time and time again. Extra value 500g box. No.12 - 38.1 x 1.6mm (1 1/2inch x 1/16inch). Q-Connect Rubber Bands No.19 88.9 x 1.6mm 500g KF10527 Pack of 1 Q-Connect Rubber Bands High quality bands with a high latex content ensuring use time and time again. Extra value 500g box. No.19 - 88.9 x 1.6mm (3 1/2 x 1/16). Q-Connect Rubber Bands No.24 152.4 x 1.6mm 500g KF10533 Pack of 1 Q-Connect Rubber Bands. High quality bands with a high latex content ensuring use time and time again. Extra value 500g box. No.24 - 152.4 x 1.6mm (6inch x 1/16inch). 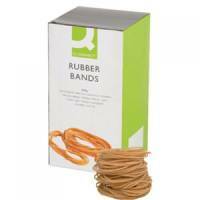 Q-Connect Rubber Bands No.30 50.8 x 3.2mm 500g KF10535 Pack of 1 Q-Connect Rubber Bands. High quality bands with a high latex content ensuring use time and time again. Extra value 500g box. No.30 - 50.8 x 3.2mm (2inch x 1/8inch). Q-Connect Rubber Bands No.32 76.2 x 3.2mm 500g KF10537 Pack of 1 Q-Connect Rubber Bands. High quality bands with a high latex content ensuring use time and time again. Extra value 500g box. No.32 - 76.2 x 3.2mm (3in x 1/8). Q-Connect Rubber Bands No.33 88.9 x 3.2mm 500g KF10538 Pack of 1 Q-Connect Rubber Bands. High quality bands with a high latex content ensuring use time and time again. Extra value 500g box. No.33 - 88.9 x 3.2mm (3 1/2 x 1/8). Q-Connect Rubber Bands No.34 101.6 x 3.2mm 500g KF10539 Pack of 1 Q-Connect Rubber Bands. High quality bands with a high latex content ensuring use time and time again. Extra value 500g box. No.34 - 101.6 x 3.2mm (42 x 1/8).